Microsoft's very approachable, says Lionhead's Gary Carr; especially Carr's new boss. 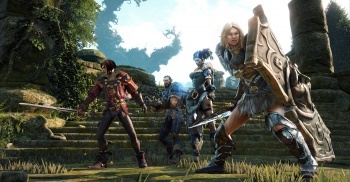 "I'm not a Microsoft corporate dude," says Lionhead's Gary Carr. "I want to make sure that Lionhead doesn't just sip the Kool-Aid, I want us to be a developer that makes games we think people actually want to play." But it's been a while since Peter Molyneux left Lionhead to form 22 Cans, and Lionhead did without a permanent replacement. Now John Needham of Cryptic fame has taken up the Lionhead leadership mantle, and Carr thinks this is a step in the right direction. "Because you don't lose Peter and just drop anybody in," says Carr, "you have to find somebody who would culturally fit in." Carr thinks Needham will do just that, despite initial concerns that Needham would prove to be just another dude in a suit. Very "non-Microsofty," says Carr, and a real people person. But Needham also brings a ton of industry skills along with him, having dipped his toe in pretty much every business model imaginable, from client based and free-to-play, to PC and mobile. Carr thinks he's going to fit in well at Lionhead, but then, even Microsoft isn't the Microsoft of yore. Carr finds himself having more in common with the Microsoft management than he'd have imagined. The people he knew as mid-level bosses years back, the ones he could have a beer with, who hung out in the same places he did, are now the folks in charge of the shop. Next up for Lionhead is Fable Legends, the game with the 10 year lifespan. "It's big and ambitious," said Needham when the announcement was made, "but it needs to be because it's going to be around a long time." Hopefully Needham lasts as long; but we'll see. The drink they used at Jonestown was Flavor-Aid, not Kool-Aid. For some reason it always annoys me that people get it wrong. Maybe it isn't a Jonestown reference, maybe its a Merry Prankster reference and Microsoft is distributing Microdots via the Electric Kool-Aid Acid Test? Is Lionhead in anyway still a relevant entity? I stopped caring after Petey boy left. Agreed. I checked their game releases just to be sure and it is all Microsoft. Also games from Lionhead, Microsoft gets to play the exclusive platform gambit. So really this just looks to me like saber rattling. Unless they come out and start releasing for other platforms I don't think much will change with this studio, hrm. The title of this article makes it seem like the content is going to be much more inflammatory than it is. It's actually quite the opposite. Not that I was hoping for something different, it's good to see that the studio has a new front man and is headed in a good direction, I just find it funny that when taken out of context the quote feels like there is a lot more fire behind it. It loves the bitter, sour taste of complete and utter crap in its mouth too much to want to wash it out. Legends isn't going to be fixing that either. Specially seeing as its nothing more than a glorified, prettied up version of the terrible (even in Fable standards) Heroes game. As for that 10 year cycle? Releasing a bunch of crap DLC a ten-year lifespan does not make. Nobody is going to be playing the game past the first year or two anyways, specially once the Fable 1 re-release comes out (as long as they aren't so braindead as to mess with the mechanics of the first game). "Drink the kool-aid of us saying we're not drinking MS' kool-aid."